The scale of the Earth is already beyond my comprehension, Jupiter just seems ridiculous. It’s kind of like playing baseball in your back yard for years and years and then going to a professional baseball game for the first time. Some things are so big they seem infinitely big. You could think in terms of people, if you want. Within about eight thousand miles of you, give or take, are somewhere between six and seven billion individuals, who each have their own history, goals, fears, and stories. Beyond that… Nobody, as far as the eye can see. Billions and billions of miles, and all the interesting people are right here. Hmm… then who (or what) was the mother …? No wonder Lovecraft went a bit nutz… He may have actually managed to completely wrap his head around the immensity that is the universe, and realized just how utterly tiny and insignificant we are. No way you can pierce that bellybutton, even if it’s an innie! I sometimes wonder if life beyond Earth is out there. It would be cool to meet aliens from another planet. And if what my father says is true (that we’re all made in God’s image), then we wouldn’t have problems with physical anatomy when it comes time for a check up on them. The possibilities are endless. My parents are Christians, who thinks it’s odd that I believe in aliens, but have a hard time believing in God. Chris you should click my name, it is relevant to your post. Now we start on the outer solar system! It’s a two week theme! OMG!!! 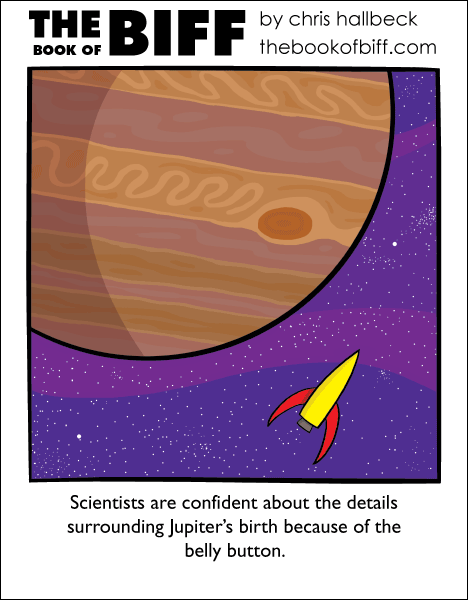 I have the same mark, Jupiter must be a relative! What are you going to do when you get to Pluto? Are you counting it as a real planet or… you know, one of those phony outer planetoids? I saw something once comparing the size of other stars, making the sun look as small as Earth does in comparison to the sun. Even freakier.